Killer Characters: Dieters and Cake Decorating...A Business Killing Combo! Dieters and Cake Decorating...A Business Killing Combo! Okay, so what's the top--or, at least one of the top--New Year's resolutions year after year after year after year? Say it with me, everybody: Lose weight! So every year after New Year's Day, my business basically tanks until February 14--Valentine's Day. Even the Save-A-Buck (a local grocery store that buys cakes from me on consignment because it doesn't have a bakery) slows up on sales of sweets this time of year because everyone is on a health kick. I'm all for healthier eating. But it's hard to go more than a month without any income, so what's a cake decorator to do? I'm trying to incorporate and advertise some new cake flavors. I found these two recipes online, and the titles link back to the original recipes. Check them out and let me know what you think. Empty a regular boxed dry cake mix, any flavor*, into a medium bowl. Add a 12-oz can of diet soda, any flavor*. Using an electric hand mixer, mix the two ingredients very well. Spray a 9x13 inch baking pan with cooking spray. Pour the mixture into the pan and bake according to temperature and time recommendations on the box of the cake mix. Allow the cake to cool completely. Then top with an entire tub of lite whipped topping. Cut into 12 squares. PERFECT light dessert. *I recommend using diet 7-up or diet sprite for white or lemon cake mixes and diet Coke or diet Pepsi for chocolate cake mixes. You can also spruce up a white cake mix by adding fresh, sliced strawberries atop the whipped topping - a very light version of strawberry shortcake! Combine 1 cup granulated sugar, brown sugar, and oil in a large bowl; beat with a mixer at medium speed 2 minutes or until well blended. Add egg substitute and eggs; beat until well blended. Add pumpkin, beating until blended. Lightly spoon 2 cups flour into dry measuring cups; level with a knife. Combine flour, baking powder, and next 3 ingredients (through salt) in a medium bowl. Gradually add flour mixture to pumpkin mixture, beating just until blended. Spoon batter into prepared pans. Bake at 350° for 30 minutes or until a wooden pick inserted in center comes out clean. Cool in pans 10 minutes on a wire rack. Remove cake from pans; cool completely on wire rack. Place 1 cake layer on a serving plate. Spread 1 cup frosting over layer, and top with remaining cake layer. Spread remaining frosting over top of cake. Sprinkle with pecans, and garnish with orange slices, if desired. So, what do you think? Could you enjoy either of these cakes and still keep your New Year's resolution to eat healthier? 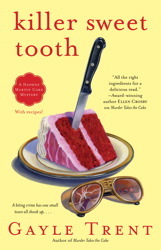 Killer Sweet Tooth is the third book in the Daphne Martin Cake Decorating Mystery Series. Learn more at http://www.gayletrent.com. First let me say that I recently just read all three books of the Daphne Martin series and really enjoyed it. I am wondering when we can see book #4. As for the recipes, I have printed them and will make the light cake this weekend since I am having family over and they need to watch what they eat as well. I actually have a sugar free cake mix to use that will be perfect! Oooh, now I'm just going to have to try the cake... fie on you, when I'm trying to reform my sweet tooth!